DVD Ripper for Mac - best Mac DVD Ripper software, rip DVD to AVI. DVD Ripper for Mac software, perfectly rip DVD to AVI, MPEG, DivX. 3herosoft DVD Ripper for Mac is all-in-one DVD Ripping software for Mac OS X users. It can help you rip DVD movies to almost all popular video formats such as WMV, 3GP, AVI, MPEG-4, RM, DivX, MOV, XviD, FLV, SWF, etc, and sorts of audio formats like AC3, M4A, MP3, WMA, WAV, AAC, etc. with super fast DVD ripping speed and excellent quality! Almost all popular portable devices are supported, such as iPad, iPod, Zune, iPhone, Apple TV, PSP, Xbox 360, PS3, MP4/MP3 Player, Smart Phone, Pocket PC, Mobile Phone, Archos, Archos AV500, Archos AV700, Archos GMini402, iRiver PMP-100, Creative Zen Vision, etc. 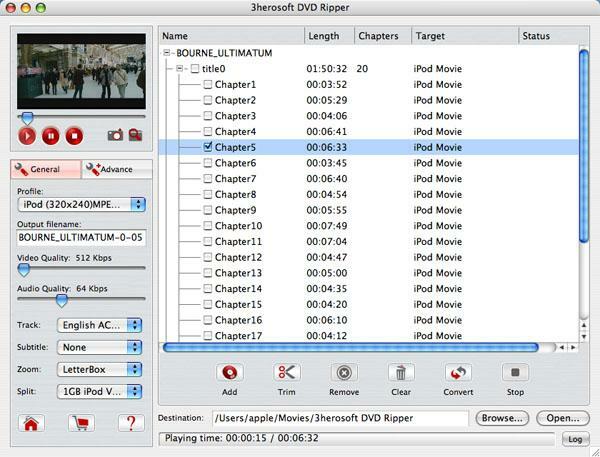 In addition, 3herosoft DVD Ripper for Mac can also completely provide you with some professional and easy to use edition functions which let you select DVD subtitle and audio track, choose any DVD chapters/titles you want to convert, trim any DVD chapters/titles and customize the unique video DVD according to your need. Free download and try this DVD Ripper for Mac software and make your digital entertainment life more colorful and wonderful. Now DVD Ripper for Mac keeps perfectly compatible with Mac OS X 10.10 Yosemite. Easily rip and convert DVD to AVI, MPEG, WMV, DivX, MP4, H.264/MPEG-4 AVC, RM, MOV, 3GP, etc. video formats on Mac. Rip and convert DVDs to MP3, WAV, AMR, WMA, M4A, AAC, AC3, OGG, RA, AU, etc. audio formats on Mac. Rip DVDs to various video and audio formats that can play on iPad, iPhone, iPod, Apple TV, Zune, PSP, Xbox 360, PS3, iRiver, Creative Zen, Archos, PMP, Smart Phone, Pocket PC, PDA, cell phone, MP4 Player, MP3 player. Trim any segments you love from DVD movie and output them with different profiles respectively, split a large source file into several smaller files to satisfy your specific need. Set start time and duration to get a segment, select target audio track, subtitle and angle for DVD ripping. This Best Mac DVD Ripper software for Mac provides you with various video and audio settings including video resolution, video frame rate, video bit rate, audio bit rate, audio sample rate and so on. Preview your movie or segment with built-in player before conversion. Easily edit ID3v1 and ID3v2 tag for output MP3 or WMA audio formats. So terse and intuitive interface, few clicks are enough to rip DVDs to all popular video and audio formats with this DVD Ripper for Mac. How to rip DVD to MP4 video files for backup on Mac? How to rip DVD to AVI files on Mac?